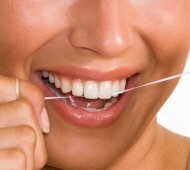 Dental hygiene helps to prevent gum disease and bad breath. It also reduces gum bleeding. People who wear Dentures, Bridges, Fillings are advised to see a hygienist on a regular basis in order to maintain a healthy and beautiful smile. Dental Hygiene treatment is performed to remove any plaque and tartar from your teeth that may have built up over time. Dental hygienist performs the procedure with the help of an ultrasonic scaler, manual scaling instruments (if needed) and polishing paste to clean the teeth. Thereafter you will be shown techniques on how to keep your teeth clean, using the best brushing techniques and most suitable products. For best results we propose to try air abrasion system. This cleaning system uses compressed air and small sand-like granules which can go to the narrowest places where scaler can’t reach. It gives extra polish to your teeth. We recommend to see the hygienist regularly and not delay your appointments, as delaying in this area can result in other unnecessary tooth/gum problems. Medidenta highly skilled dental team will carry out expert procedures and advise you what is the best for your teeth and gums. If you have sensitiv teeth, procedure may be done under local anesthetic.